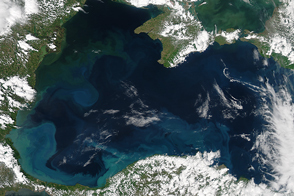 The Black Sea more closely resembled mixed paint on an artist’s palette than the normally black surface of deep water when the Moderate Resolution Imaging Spectroradiometer (MODIS) on NASA’s Aqua satellite captured this image on June 20, 2006. 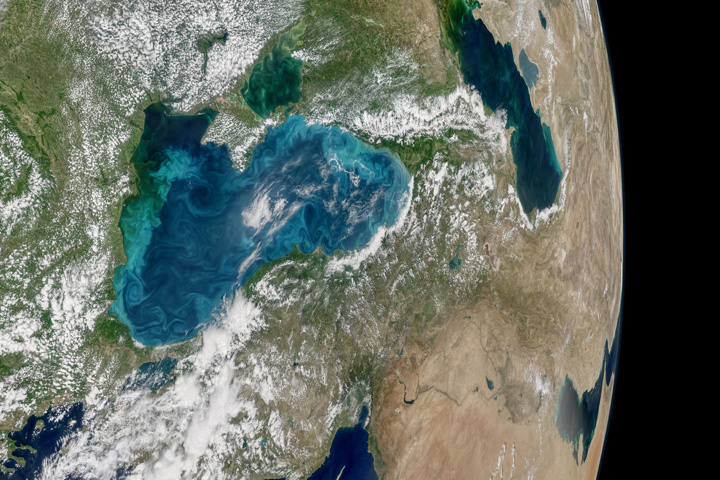 Swirls of color ranging from deep olive green to bright turquoise were created by a massive phytoplankton bloom that covered the entire surface of the sea. The sea was able to support such a large bloom largely because of its unique structure. Many of Europe’s largest rivers, including the Danube, the Dnister, and the Dnipro (also called Dnieper) dump fresh water into the sea. The sea’s only source of salty water, on the other hand, is the narrow Bosporus Strait, which connects it to the Mediterranean Sea through the Sea of Marmara. The salty water is denser than the fresh water, and so it sinks to the bottom, leaving a layer of relatively fresh water on top. The density barrier between salt and fresh water is great enough that the two layers do not mix. As a result, when fresh water enters the sea from rivers, it only mixes with the relatively fresh water in the top 150 meters of the sea. This means that fertilizers and runoff carried in the river water remain concentrated in the top of the sea where they nourish the tiny plants (phytoplankton) that grow on or near the surface. In the spring of 2006, floods on the Danube River swept over broad stretches of farmland. The floods likely washed sediment, fertilizers, and animal waste into the Danube and the Black Sea. The extra iron, phosphates, and nitrates in the flood debris may be supporting the extensive bloom seen here. Such blooms can be both beneficial, because they provide food for fish, and dangerous, because decaying plant matter saps oxygen out of the water. If enough phytoplankton from a large bloom die and decay, the water may become so oxygen poor that fish can no longer survive in it. The result is a dead zone where little can survive. Dead zones normally happen near the mouths of large rivers where fertilizers and agricultural waste are concentrated in the ocean. 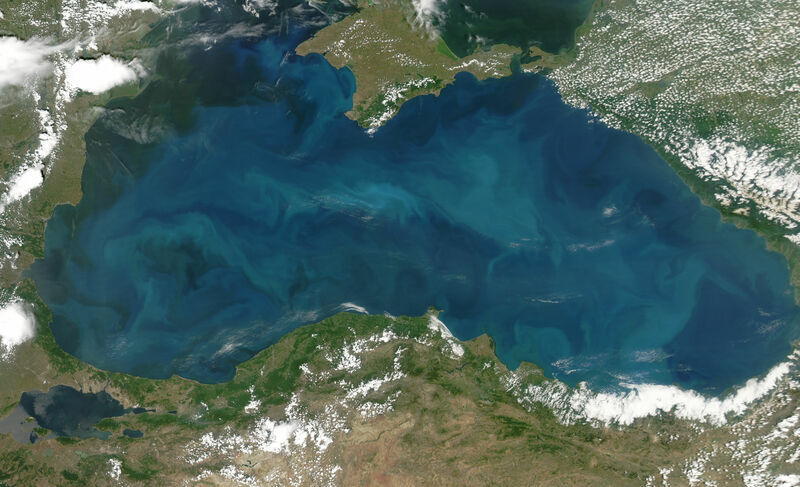 The Black Sea is one of the world’s largest dead zones, though its dead zone is related to its stratification as much as to fertilizer run-off. When plants and other organic matter sink to the floor of the sea, they decay in the salty layer of water. Since the denser salt water does not mix with the fresher water at the surface, there is no way to replenish the oxygen used during the decay process. As a result, the lower layer of the Black Sea is totally oxygen-free. The large image provided above has a resolution of 250 meters per pixel. The image is available in additional resolutions from the MODIS Rapid Response Team. 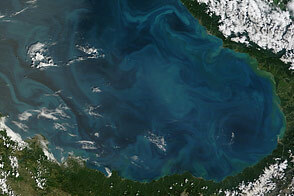 Creeping Dead Zones, from the NASA Ocean Color Group. Drought & Deluge Change Chesapeake Bay Biology, is an Earth Observatory feature that talks about the development of dead zones in the Chesapeake Bay. In particular, see page 2, "The Two Faces of Nitrogen: Nutrient or Nemesis." What are Phytoplankton?, a fact sheet provided by the Earth Observatory. 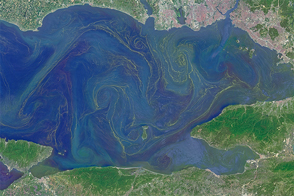 These images of the Black Sea show swirling blooms of phytoplankton coloring the surface waters blue and green.